[Photonics] – Photonic integrated circuits: the future of High-Speed technology? 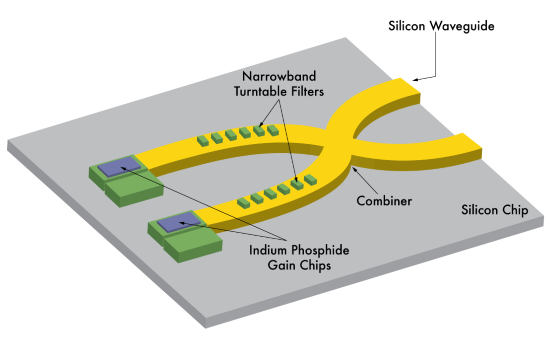 Home / News / [Photonics] – Photonic integrated circuits: the future of High-Speed technology? Integrated circuits are key to modern hardware since its invention by Jack Kilby in 1958. If actual microchips are a set of electronic components on a semiconductor wafer, the same functions can be obtained using light instead of electrons. And benefits of photonic integrated circuits (PICs) are important : higher speed, lower energy loss and a greater bandwidth. Indium phosphide (InP) is the most mature and high performance PIC platform, and NASA use it for space applications for its reliability. A way of making a PIC with InP is to grow an epitaxial material structure on the InP substrate, for example by MOCVD. In this example, the active region can be made of an InGaAsP multi-quantum well.